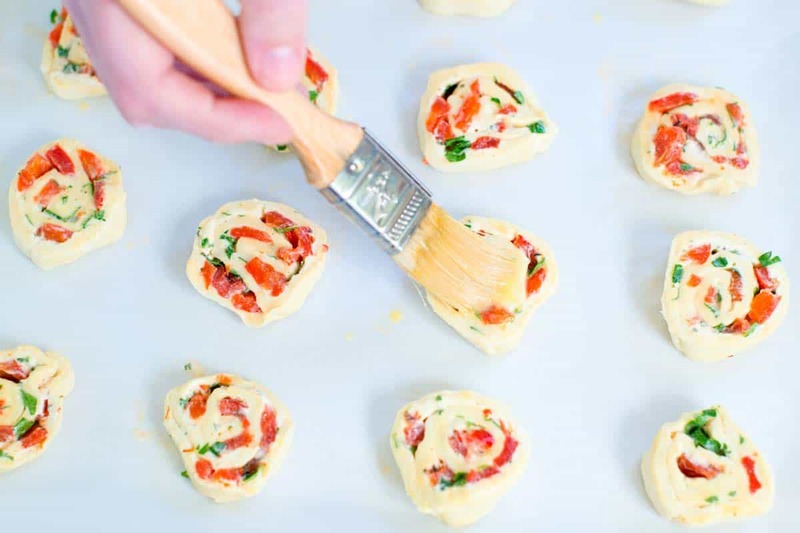 How to make delicious pinwheel pastries made with puff pastry, garlic-herb cheese spread, roasted red peppers, and parmesan cheese. 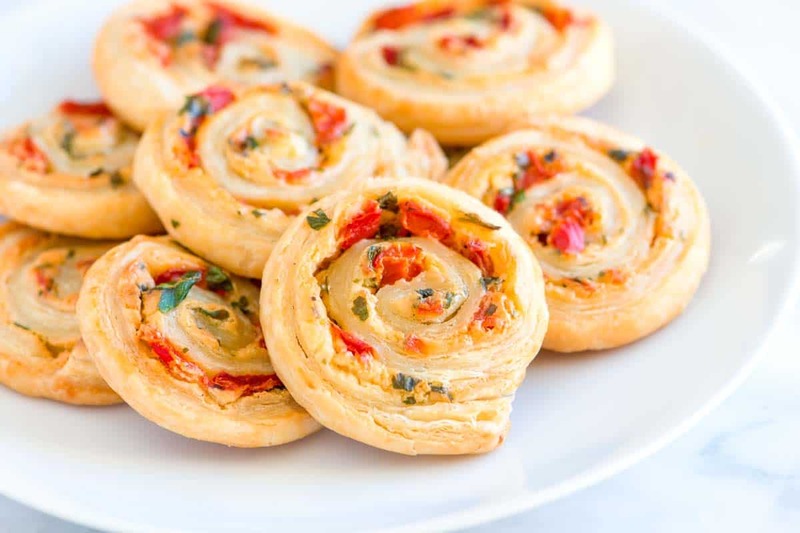 Jump to the Cheesy Roasted Pepper Pinwheel Recipe or read on to see our tips for making them. When we’re entertaining we always try to be prepared. It makes no sense to invite friends over and spend all your time in the kitchen while they’re stuck waiting for food in the next room. That’s why we love sharing recipes that can be made in advance and can be served warm or at room temperature. 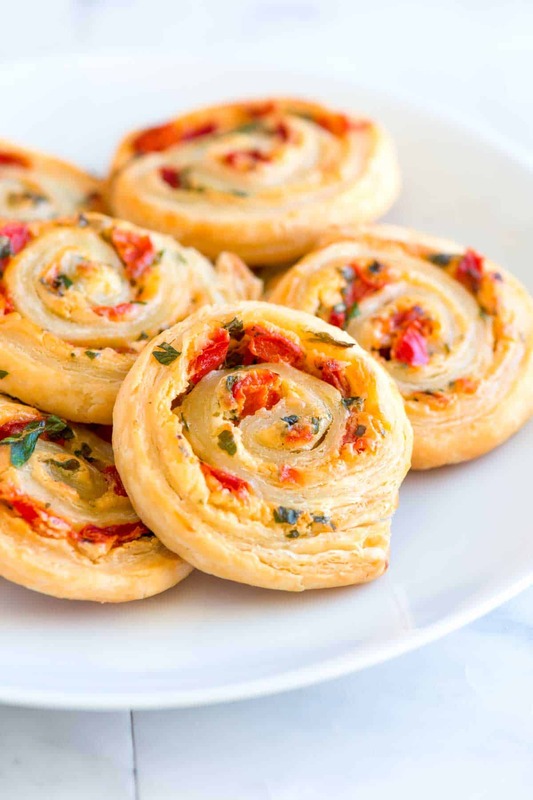 These cheesy pinwheels with roasted red peppers are exactly that. 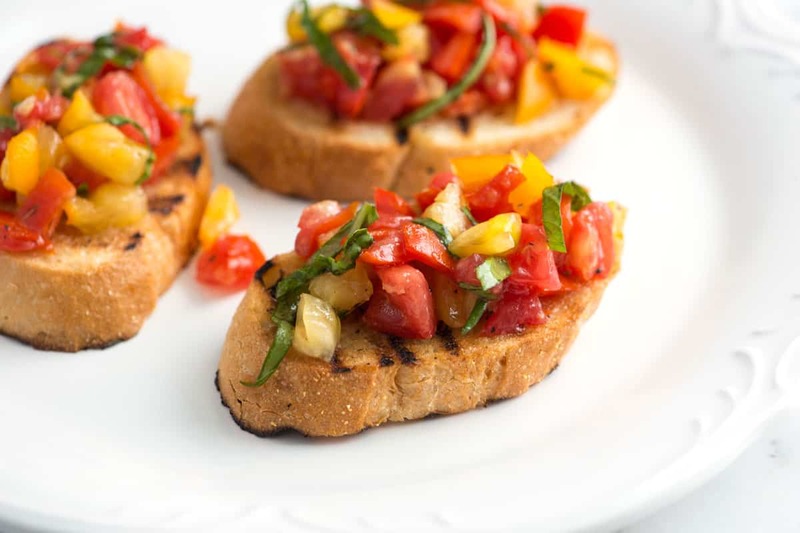 YOU MAY ALSO LIKE: How to make our favorite bruschetta with tomatoes and basil. Plus, five easy tips for how to make it best. Jump to the Tomato Bruschetta Recipe. Since we use store-bought puff pastry dough, these pinwheels are easy to make and can be made in advance. Plus, they are easy to adapt. 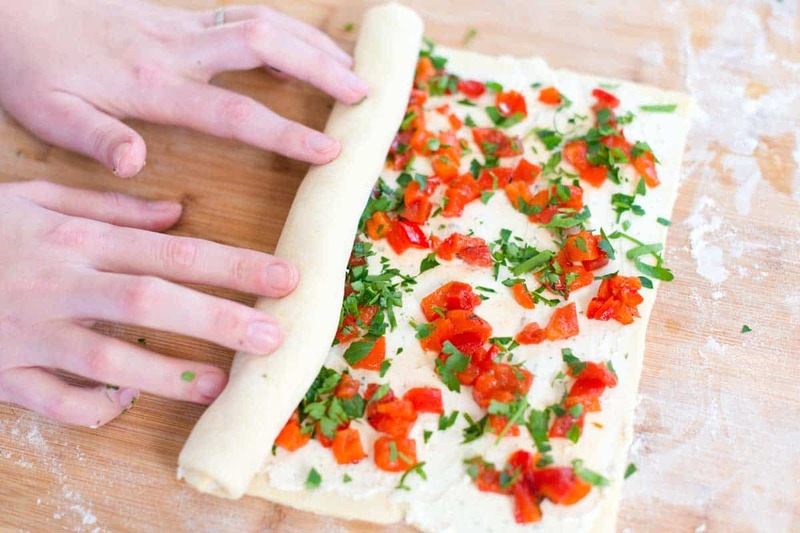 In the recipe below, we roll up roasted red peppers and garlic-herb cheese. You could roll up just about anything — think bacon, ham, vegetables, or even chocolate. We used puff pastry dough from Pepperidge Farm — it’s sold in the freezer section. If you can’t find Pepperidge Farm’s puff pastry sheets, feel free to use another puff pastry dough, store-bought or homemade. Once rolled up, we brush the pinwheels with egg wash and bake. They’ll take less than 20 minutes! YOU MAY ALSO LIKE: Thanks to store-bought puff pastry, you really can make flaky, homemade chocolate croissants without the extra time and fuss. 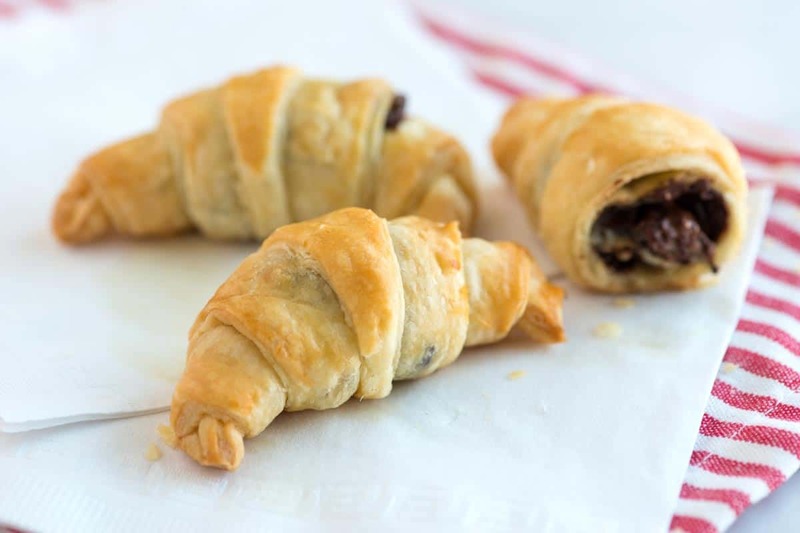 Jump to the Chocolate Croissants Recipe. We use a store-bought puff pastry sheet instead of making our own pastry at home. The puff pastry sheet needs to be thawed before using. 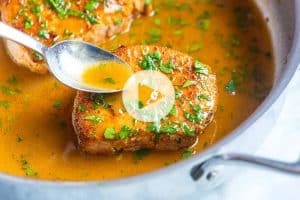 So, either place into the refrigerator and leave overnight or remove and thaw at room temperature for 40 to 50 minutes. Feel free to substitute your favorite spreadable cheese or other toppings instead of the peppers. Cooked and crumbled bacon, ham, turkey, sausage or other veggies are great. Heat the oven to 400 degrees F. Beat the egg and water in a small bowl with a fork or whisk, set aside. Lightly flour your work surface. Unfold the pastry sheet then lightly dust top with flour. Use a rolling pin to roll lightly so that the creases are flattened out (you don’t want to make the square much bigger). Brush square of pastry with egg wash. Evenly spread with the 1/2 cup of garlic and herb cheese then evenly scatter the diced peppers, Parmigiano-Reggiano cheese and parsley (or basil). Starting at the side closest to you, roll pastry up like a jelly roll. Cut into 20 1/2-inch slices. (A serrated bread knife works well for this). Place slices onto baking sheet. Then, lightly brush tops with egg wash.
Bake 14 to 18 minutes or until light golden brown. Serve warm or at room temperature. Thanks for the Recipe these savouries turned out beautifully and are wonderfully tasty, and not really spicy, but flavour, my husband says “they are a definite do again!” I made these for a kitchen tea and did bacon and cheese ones as well. 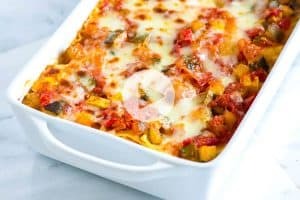 Hello, can I use short crust pastry for this recipe? Would there be a difference in cooking time compared to puff pastry? Yes you should be able to. I’d expect the cooking time to be similar, but stay close to the oven while baking just to make sure. What does the egg do? Can it be avoided? Hi Raman, The egg helps the pastry brown and hold together. You can probably get away with not using, just make sure you roll the pinwheel up tightly. This has to be one of the worst recipes i have ever made. Totally tasteless. Hi Ger, we are sorry you did not enjoy the recipe. subbed basil for parsley and baked for about 20 mins then transported to a party about 2 hours away and were a hit even at room temperature. will definitely make again! love the pinwheel pastry recipe! 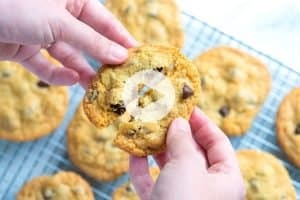 Can i freeze before baking? Then, bake before a party next week? If so, should i bake from frozen state, or thaw first? Freezing should be fine. We’d thaw for 20 minutes or so then bake. These were excellent! So simple to prepare, yet so tasty. I subbed basil for the parsley, and other than that, followed this recipe to a tee, and they came out perfect. 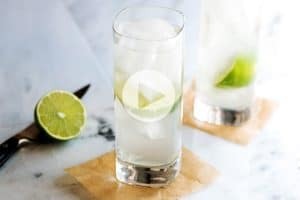 I served these at my annual Sangria Party, and they were a hit.